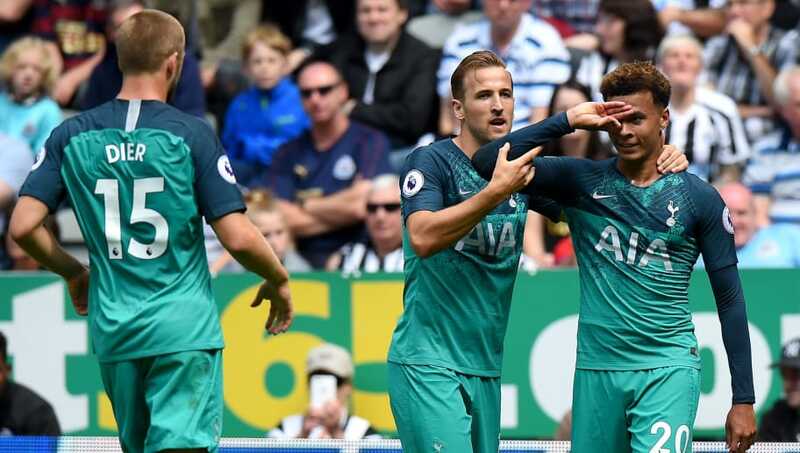 ​Tottenham opened their Premier League account for the season with three points on Saturday afternoon after securing a 2-1 victory over ​Newcastle United at St James' Park. A frantic opening term saw three headers rustle the back of the net in the space of just nine minutes, with Spurs taking the advantage through Jan Vertonghen and Deli Alli - while Joselu netted for the home side. The Magpies were positive in possession throughout but lacked the clinical edge to make the most of their opportunities, while Spurs silenced early suggestions of fatigue following an abundance of players' late involvement in the World Cup. Here is a breakdown of the second game of the ​Premier League season. Despite failing to take anything away from the game, Newcastle impressed after taking the game to Tottenham - with loose defending and goal line technology to blame. But Mike Ashley's best attempts to sabotage the club from within have led to a finely balanced start to the season for the Magpies, with three points a must against the newly promoted Cardiff next week as meetings against three of last season's top six follow in as many weeks. The temperature is sure to rise at St James' Park should results fail to come, but rest assured all anger will be directed anywhere but at Rafa Benitez. Starting XI: Dubravka (6), Yedlin (6), Lascelles (6), Clark (6), Dummett (6), Diame (6), Shelvey (7), Ritchie (8), Kenedy (8*), Perez (6), Joselu (7). Substitutes: Rondon (7), Atsu (6), Muto (N/A). STAR MAN - Kenedy made a significant impact for Newcastle in the second half of last season and he looks to have picked up from where he left off having added a much needed touch of star dust to the Magpies' midfield ranks. The Brazilian was a constant thorn in Spurs' side - with the exception of fluffing his lines early in the second - making dominant weaving runs up the field, disrupting their forward play and for a lack of a better word, he was just a menace. And it had social media talking. Kenedy completed more take-ons (4) and won more fouls (3) than any other Newcastle or Spurs player in the first half. WORST PLAYER - A second half shot off the post was a rare highlight for Mohamed Diame who struggled to keep up with the temp of the game and find a meaningful pass. With competition heating up for a midfield spot, his place in the side could be in jeopardy. For all of the talk surrounding Spurs' lack of transfer activity and lingering fatigue throughout the squad after an intense summer period, a World Cup hangover failed to take a toll where it mattered most - the scoreboard. Six players who featured in the semi-finals in Russia started from the off against the Magpies, and while Eric Dier and Harry Kane were notably off the boil, Tottenham's overall performance showed little signs of weariness despite the lack of preparation. Starting XI: Lloris (7), Aurier (5), Sanchez (6), Vertonghen (7), Davies (6), Dier (6), Sissoko (6), Eriksen (7), Dele (7), Lucas Moura (6), Kane (6). Substitutes: Dembele (6), Heung-Min (N/A), Amos (N/A). STAR MAN - The World Cup winning captain in Hugo Lloris continued his fine run of form in between the sticks for Tottenham after pulling out a number of sensational saves to key Newcastle at bay. An all round dominant performance, despite conceding early on. WORST PLAYER - Despite heading back to north London with all three points, not all of Mauricio Pochettino's men took flight in their opening game on the season. While Kane and Lucas Moura floated through proceedings, Serge Aurier - despite registering an assist - was erratic both in and out of possession and Kieran Trippier will no doubt be welcomed back into the team with open arms. Here's how his performance was assessed on Twitter. The issue with Aurier is he appears to have very little positional awareness. He’s constantly chasing the ball with little thought as to the gap/space he’s leaving behind him. Also Also Aurier: No, don't pass. That's Sissoko. Cross. Also Also Aurier: Let's compromise. We'll do both our things, just don't pass to Sissoko. Also Aurier: See. Told you we should have passed. Newcastle will hope to kick start their season's points tally away at ​Cardiff next week, a game which precedes a tough run of fixtures which includes ​Chelsea, ​Manchester City and Arsenal in quick succession. Spurs meanwhile will look to maintain their winning ways when they head back to Wembley as they await the opening of their new stadium, with Fulham the visitors.